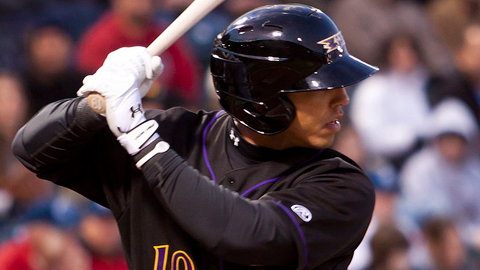 Louisville manager David Bell has seen Neftali Soto get hot before. Last season, as a matter of fact. "He was hurt for about a month in April and May," said Bell, Soto's manager at Double-A Carolina in 2011. "But when he came back, it didn't take long until he got really hot." Soto played in only 20 games the first two months of last year due to a broken bone in his wrist. He was hitting .243 in mid-June before a spurt of five homers in six games jump-started his season. After hitting three homers the first two months of 2011, Soto belted seven in June, then had 10 in both July and August to tie for the Southern League lead with 30 while adding 76 RBIs in 102 games. So it's understandable that Reds officials aren't overly concerned about the start of this season, Soto's first with Louisville. The 23-year-old has batted .238 in his first 62 games, although he leads the Bats with eight homers and 31 RBIs. While Soto may not be worried, he is far from satisfied with his first full season at the Triple-A level. "It's been tough," he told the Louisville Courier-Journal. "This is not what I was expecting. I thought it would be better. "I feel like guys in Double-A are nasty, throwing harder. But here, they work more around you. They know how to pitch here." That experience shows in the 65 times Soto has struck out to go with only 17 walks that contribute to a .289 on-base percentage. "He's getting at-bats and, at this point in his career, that's the key," Bell said. "He's making adjustments day-to-day, and that's something that will happen for the rest of his career." It helps that the Reds seem to have settled on first base as Soto's position. Originally drafted as a shortstop, the native of Puerto Rico moved to third base, then spent part of 2010 as a catcher before switching to first base full-time last year. Bell said Soto seems to be following a track similar to the one he experienced last season in Carolina. "He's a young player and young players just play better as they gain experience," Bell said. "Once he got some at-bats last year, he gained experience and played better. The more you play, the better you get." Bell added that Soto, who has missed time recently due to mild back spasms, added to his value because of his fast finish in 2011. "Players who are good over the second half of the season are more valuable," Bell said. "If a guy plays well down the stretch, when his team is fighting for a pennant, people tend to notice that." Night and day: It has been an up-and-down season for Gwinnett RHP Jair Jurrjens. He was 2-0 with a 2.05 ERA after his first three starts but has gone 1-4 with a 7.34 ERA since. Things have gone especially bad in night games: In six starts under the lights, Jurrjens is 1-4 with a 8.10 ERA, while his three starts in matinees have produced a 2-0 record and 1.17 ERA. For the season, he's 3-4 with a 5.27 ERA. Pitching in: Indianapolis has ridden the best pitching staff in the IL to first place in the West Division. The Indians were 19-11 in May, thanks in large part to a 2.52 team ERA for the month. The Tribe has only one pitcher among the IL leaders in ERA -- LHP Rudy Owens, who's second with a 2.34 mark -- but leads the league with nine shutouts. For the season, Indianapolis has a 3.02 ERA. He said it: "You just never know what's going to happen. When you think you're in, you're out; when you think you're out, you're in. Baseball has a way to work itself out eventually." -- Columbus OF Trevor Crowe to the Columbus Dispatch. Crowe, who missed more than a month with a strained right oblique, is batting .307 in 21 games. He said, Part II: "I've been struggling at the plate a little bit. So I was just trying to make good contact and got a fastball up and hit it out." -- Syracuse RHP Mitch Atkins to the Syracuse Post-Standard on June 10. In a win over Louisville, he hit the first homer by a Chiefs pitcher since Ed Ricks on June 15, 1975 at Pawtucket. John Wagner is a contributor to MLB.com. This story was not subject to the approval of the National Association of Professional Baseball Leagues or its clubs.